When eHarmony was looking to partner with a company for a new creative angle for their 2010 “Love Begins Here” ad campaign, they looked no further than the unique technology and photo mosaic design of Picture Mosaics. 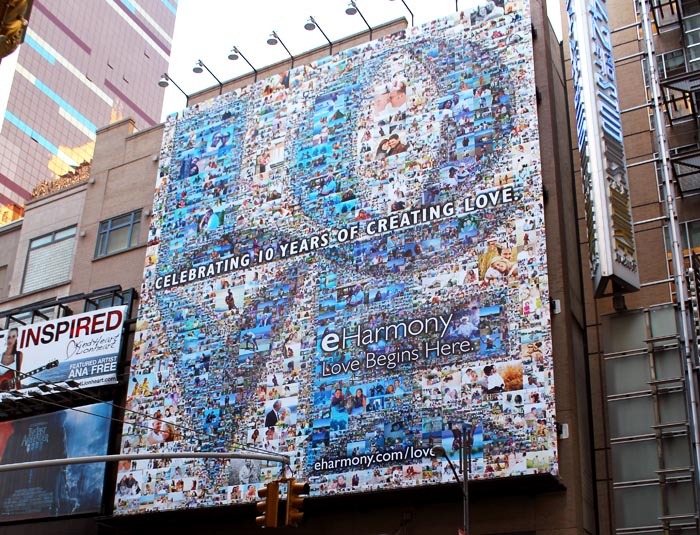 eHarmony had the initial conceptual direction for a photo mosaic, however wanted Picture Mosaics to dig deep into their creativity and technology to produce something truly unique and special that would capture the campaign’s message and stay true to their branding. This entry was posted in eHarmony, Mosaics, Online Interactive Photo Mosaics, Photo Mosaic Software, Photo Mosaics and tagged anniversary, eHarmony, fan activations, mosaic, photo mosaic, photomosaic, teambuilding, Times Square on November 30, 2014 by Robert DeCarolis.